Help Empire West Studios Create New Jobs!!! PLEASE HELP EMPIRE WEST STUDIOS GET 250 VOTES BY JUNE 30TH!!! Empire West Studios in Tempe is trying to get 250 votes to qualify for the $250,000 CHASE MISSION: SMALL BUSINESS GRANT. As of June 29th, we are at 225 votes. Need the 250 by Saturday, June 30. Could you PLEASE help out by taking a moment to vote. And please tell all of your friends to vote. We’d greatly appreciate it. …Hope all is going well in your world. 2) Click “Log in and Support” button. 3) Log in using your Facebook username & password. The International Talent Showcase (ITS), one of the top model and talent showcases in the nation, is now scheduling FREE auditions targeting Models, Actors, Singers and Dancers. . .Children, Teens and Adults. . .for the opportunity to perform LIVE in front of the world’s top model & talent agents at the ITS’s annual five star event in Boca Raton, FL, July, 2012. This showcase allows you to perform in front of dozens of top agency scouts all under one roof and actually meet and talk to them about your career. You could actually be signed right on the spot! Your chances of getting a major New York, London, Paris or Hollywood agent and your Modeling, TV, Film, Music or Dance career off to a flying start have never been better! Auditions will take place at Empire West Studios (EWS), ITS’s Phoenix Director and the leading Model & Talent Photography studio for Children, Teens and Adults, located at 2209 W 1st St, Ste 104, Tempe, 85281, 480-303-9359 on Wednesday, October 12, 2011 at 7PM. To sign up for your FREE audition simply go to the Empire West Studios website, click on the red ITS logo and enter your e-mail in the pop-up window. When you click “Join,” a registration form will appear. Fill out this form completely and check the Oct. 12th, Tempe audition date, then click “Save Profile Changes.” An ITS representative will be in contact with you to schedule your audition. 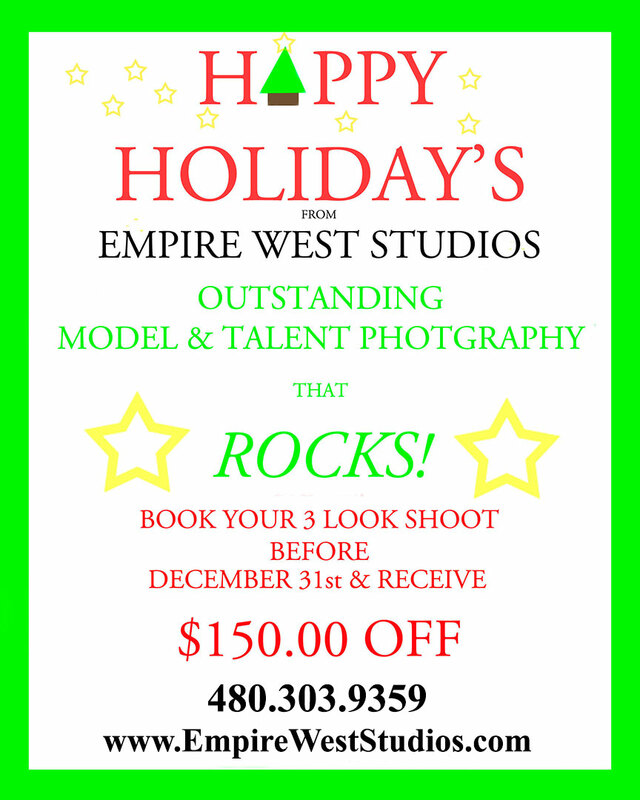 Please make sure you take some time to review our Empire West Studios website at www.EmpireWestStudios.com. Arizona’s Got Dance! National Dance Day! will be held this coming Friday and Saturday, July 29-30, at the Nelson Fine Arts Center – ASU Tempe Campus – 51 East 10th Street Tempe and Sunday, July 31, at Tempe Center for the Arts, 700 W. Rio Salado Parkway, Tempe, AZ. This event, hosted by Dancers And Health Together, Inc., consists of two days of dance workshops (Yoga, Agility/Endurance, Ballet, Contemporary Modern, Hip Hop, Breaking, Modern, Jazz, Fusion, Contemporary, Zumba/African) closing each day with panels discussing the subjects of dance, health, and career planning. On Sunday. at Tempe Center for the Arts. the event will continue by showcasing some of the best dance companies in Arizona. Empire West Studios will have booths at both the workshops and the showcase. Their display and presentation will specifically target dancers along with other surprises. Clayton Hall, photographer and president of this top Model & Talent Photography studio, will also be featured on the panel discussion Friday night at 6:30 PM. Hall will be speaking about different strategies dancers can employ to go from the amateur to the professional level. For complete information please click on the Arizona’s Got Dance! National Dance Day! Facebook link above.